This perennial family favourite, the pasta bake, gets a lighter touch with a healthy boost of vegetables. 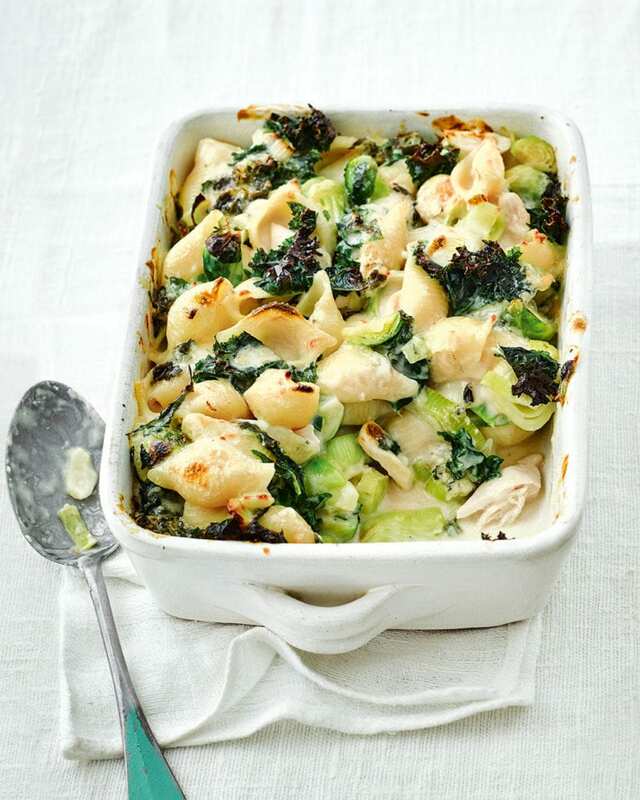 We’ve slashed the calories to under 500 per serving while retaining the richness you want from a creamy pasta bake. Heat the oven to 200°C/180°C fan/gas 6. Put the milk, stock and chicken in a large pan and bring to a simmer for 5 minutes or until the chicken is cooked through. Remove from the heat and transfer the chicken to a plate using a slotted spoon. Pour the poaching liquid into a jug. Meanwhile, heat a splash of oil in a large heavy-based frying pan and cook the green veg with a splash of water until just tender. Remove the veg and set aside with the chicken. Heat the remaining 3 tbsp olive oil in a pan with the flour and stir until it smells toasty. Gradually add the warm chicken poaching liquid, whisking until smooth and incorporated. Bring to the boil, then simmer for 5 minutes until thickened. Cook the pasta according to the pack instructions, drain, then tip straight into the sauce along with half the blue cheese, the crème fraîche and mustard (if using). Stir well to coat the pasta with sauce. For vegetarians, swap the chicken for roast root veg and use veg stock in step 3. Make and assemble the pasta bake the day before and cool, then chill, covered. Bake from chilled for 30-35 minutes until piping hot throughout. We replaced butter with light olive oil for the white sauce to bring down the saturated fat content. We only used a little cheese but it’s a strong one for a rich flavour. We also upped the veg to make sure the bake feels hearty enough for big appetites.